PBS has announced that it will be broadcasting a documentary next week called "Willie Velasquez: Your Vote Is Your Voice," and many young Latinos will probably be asking who Willie Velasquez is. With his rallying cry of “Su Voto Es Su Voz," — your vote is your voice — Willie Velásquez started a grassroots movement that would change the nation’s political landscape and pave the way for the growing power of the Latino Vote. An early protégé of the late U.S. Congressman Henry B. Gonzalez, a young Velasquez was mentored by the generation of Mexican-American activists who helped elect President John F. Kennedy. 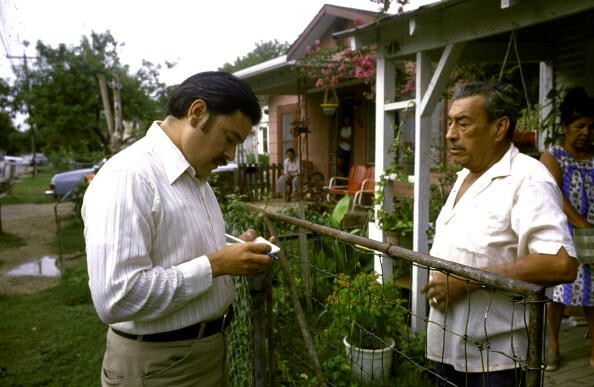 Velasquez saw how poll taxes and voter intimidation kept Mexican-Americans from the polls and sought to change that. Although he is no where near as famous as Cesar Chavez, Velasquez helped the civil rights activist organize many of the strikes that enabled Latino farm workers to obtain fair working rights. He also became captivated by the radical Chicano Movement until leaders opted to form an ethnic-based political party called La Raza Unida. Velasquez left organized politics and started the nonpartisan, nonprofit Southwest Voter Registration Education Project. The group's goal: register as many Latinos to vote as possible in Texas, New Mexico, Arizona, California and Colorado. On a shoestring budget, Velasquez and his army of recruits went door-to-door to register Hispanics to vote despite efforts by local authorities and threats of violence to stop them. Sadly Velasquez was only 44 years-old when he died. He was eulogized by Massachusetts Governor and Presidential hopeful, Michael Dukakis. His family also received condolences from Ronald Reagan, who was the U.S. President at that time. Why did Willie Velasquez stay under the radar for so long. How is it that we are only becoming aware of him? Hector Galan, who is the producer and director of the special, has an idea. "I think one reason Willie is not better known now, is that he was just taking his regional movement national when he died," Galan said, "He had only a few years in the national arena." The story that his sister, Stella Velasquez Cortez is telling of a young man with an old soul. "When we were walking home from school, he would ask me, "Who is more important, Truman or Eisenhower? Watch the documentary on PBS.